Suspension | ATRO Engineered Systems, Inc. Whether for your truck, trailer, bus, agricultural or military vehicle, suspensions are critical for keeping you on the road and productive. ATRO was born with an innovative and patented design on a torque rod bushing over 30 years ago, and today is the recognized industry leader in polyurethane parts for heavy-duty suspensions. Providing peak performance and improving ride quality is the mission that drives ATRO. The result is a full line of long-lasting, high-performance parts including torque rods, bushings, springs, pads and hardware for all major suspensions on the road today. ATRO's use of ATRO POLYs, 11 proprietary polyurethanes specifically designed and engineered and chemically resistant to contaminates such as road salt, grease, oil, acidic cleaning solvents, hydraulic fluid and diesel fuel, allow ATRO to create world-class suspension parts. OEM parts are redesigned to improve or exceed performance. ATRO suspension parts keep truck on the road and out the repair bay. 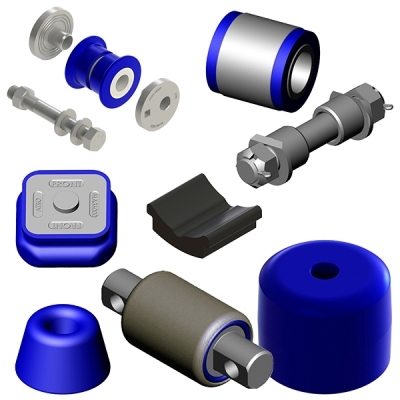 Whether it'storque rod bushings, pivot bushings, equalizer bushings, trunnion bushings, flange bushings, hinge bushings, spring eye bushings, Air Ride bushings, Air Leaf bushings, walking beam bushings, leaf spring bushings, pivot arm bushings, trailing arm bushings, drawbar eye bushings, shock bushings, center bushings, beam end bushings, booster cylinder bushings, drop axle bushings, control arm bushings, torque arm bushings, vertical bushings, equalizer bushings, pivot bushings, lever pivot bushings, sway bar bushings, spring link bushings, spring rail bushings, bus bushings, transit rod bushings, severe duty bushings, thrust bushings, oversized bushings, D-pin bushings, hollow mount or straddle bushings . . . you can count on ATRO making it, and making it better than anyone else in the industry. With 30 years of truck parts experience, ATRO designs and manufactures a complete line of replacement parts for a wide range of suspension systems including polyurethane wear pads, load pads, rest pads, spring axle pads, axle stops, spring end pads, center load cushions, jounce stops, rebound springs, load springs, spring insulator pads, bolster pads, bolster springs, progressive and auxiliary load springs, overload springs, swing arm springs, shear springs, sway bar isolators, spring rollers, bolster pivot compression rings. ATRO also offers complete suspension part kits which make it convenient to order and service your suspensions. These include pivot bushing kits, hardware kits, torque rod bushing kits, sway bar rebuild bushing kits, sway bar conversion kits, spring roller kits, suspension rebuild kits, insulator kits , trunnion bushing kits, spring eye bushing kits, lift axle bushing kits, progressive load spring kits, auxiliary load spring kits, center bushing kits, beam end bushing kits, hardware-only kits and numerous adapter kits. 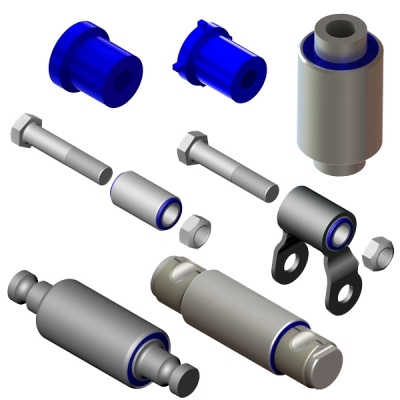 And to complete your suspension needs and make ATRO your one-stop shop, ATRO engineers and offers wear plates, thrust washers, wear washers, sway bar shaft collars, insulator spacer blocks, concentric collar, eccentric collars, auxiliary shims, restrictor cans, spigot caps and end plugs. With ATRO's industry-leading Three Year Warranty, you can count on ATRO parts to keep your suspension running smooth for a long time.